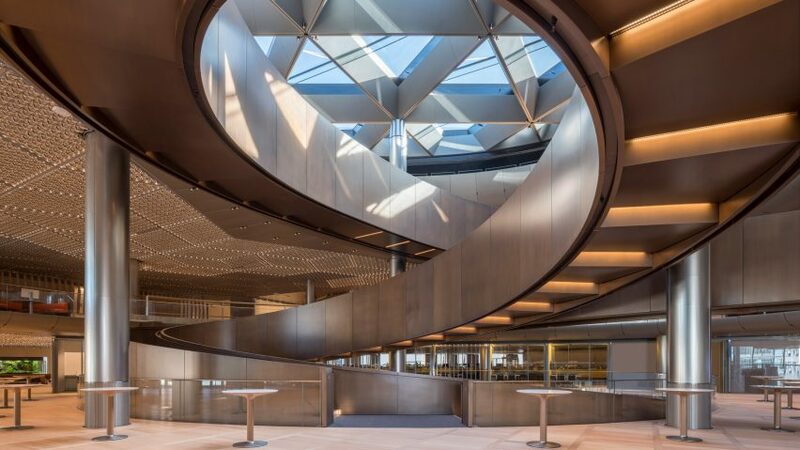 Fosters + Partners' Bloomberg HQ is a "vote of confidence in London"
Bloomberg's Norman Foster-designed European headquarters in London "sends a clear message to the world" that the UK capital remains a centre for global investment, said Sadiq Khan. Speaking at the official unveiling of building, the mayor of London thanked American business magnate and former New York mayor Michael Bloomberg for what he called a "vote of confidence in London". "It shows that despite Brexit, London is open. Open to business, open to investment, and open to some of the best design in the world," said Khan. Office buildings for major corporations have become particularly political since the UK voted to leave the European Union, leaving a question mark over London's status a global financial hub. Frankfurt, in Germany, has seen a spike in high-rise towers being commissioned since the vote. With big banks potentially looking to base their operations elsewhere, other European cities are vying to position themselves as attractive alternatives. "Whatever London and the UK's relationship to the EU proves to be, London's language, timezone, talent, infrastructure and culture all position it to grow as a global capital in years to come," said Bloomberg's founder at the opening. However it emerged that Bloomberg had made very different comments at conferences in Boston and Paris ahead of the building's opening, describing Brexit as "single stupidest thing any country has ever done" apart from America's election of Donald Trump as president. "Would I have done it if I knew they were going to drop out [of the EU]?" he added. "I’ve had some thoughts that maybe I wouldn’t have, but we are there, we are going to be very happy." For the London building Bloomberg rejected the concept of a shiny tower in favour of building "the world's most sustainable office", a 10-story block with a frame hewn from Derbyshire sandstone and accented with hand-patinated Japanese bronze fins that reference the architectural language of the historic buildings that surround it. "For many companies our size, building a new headquarters would have meant opting for a glass skyscraper," said Bloomberg, who is the 10th wealthiest person in the world according to the Forbes billionaire list. "Given the price of London real estate and the cost of construction materials the economics would bear that out. But at Bloomberg we've never made decisions based on short-term costs," he added. "That's the beauty of being a privately held company; we don't have to base decisions on quarterly earnings or shifts in the political winds." The headquarters will unite the entire UK Bloomberg operation, which was previously spread over several sites in London, and house the company's 800 software engineers. The latter team, which has tripled in size in the past four years, is focused on developing AI and machine learning applied to financial markets. Foster + Partners joined the project back in 2010 and was given an undisclosed budget to invest in developing and testing a wide range of new technologies to design a sustainable building on such a large scale. "Mike is inspirational as the patron of sustainability," said Norman Foster. "The building itself is a testimony to those ideals." The natural ventilation system was something that Foster claims has "never been done before". Bronze fins on the facade filter noise and sunlight, drawing in air through vents which pass over a ceiling carpeted with aluminium "petals" that regulate its temperature, before rising through a central atrium. No expense was spared in the prototyping of the building's sustainability features. Computational fluid dynamics were used to test the airflow with digital models of the building. Salt water modelling was also used for testing, with a 1:50 scale model submerged in a bath, dyed salt solution injected and water flow patterns analysed. A scale model was also used to subject the building to extreme environmental stress tests. With no laboratory big enough to hold it, a warehouse in Battersea was procured and a 1:1 model with 30 workstations built inside. The miniature headquarters was then tested for a period of time at temperature highs on par with the tropics as well as sub-zero, arctic conditions. As well as minimising it's impact on the climate, the Bloomberg building has been designed to withstand climate change. Along with cooling the air with water like a radiator, the folds in the aluminium petals simultaneously reflect light from LED lights inserted between them and provide acoustic control by refracting sound. The team from Foster + Partner was inspired to develop the panels by fin-de-siècle pressed-tin ceilings they saw on trips to New York. "We wanted to see if we could use that straight-forward pressing technology to create something that was beautiful but also incredibly functional," said Michael Jones, a senior partner at Foster + Partners. "Without the ceiling the sustainability wouldn't be what it is." The glass lifts are another feat of engineering. Foster + Partners held a competition to develop and entirely new lift system that runs as cantilevers off the external facade. "We had to build a test tower in Helsinki to proof of concept," explained Jones. Even the curved sit-stand desks, hand chosen by Bloomberg who has one in his own office, were tested by teams in the New York headquarters before being installed. "Some people say the reason it took us almost a decade to build this is we had a billionaire who wanted to be an architect working with an architect who wanted to be a billionaire," Bloomberg joked in his opening speech. The resulting is an astounding level of attention paid to detail. The spiral lobby on the ground floor is clad in laser-engineered American red oak planks with micro perforations to control acoustics, with ceilings painted the exact shade of Regency blue popular in 18th-century English interiors. "We tried to borrow and reinterpret some of the quintessentially English architecture that you see around the city," said Jones, who described the foyer as a "twist" on a traditional wood-panelled lobby. The recessed seating areas snake around the perimeters of some floors were called "ha-has" by the architects after the element of landscaping frequently found in the grounds of English deer parks. Uninterrupted lines of sight and informal meeting areas, such as the small circular centre desks between each seating unit and the standing meeting rooms with glass walls for writing on, were developed in response to Bloomberg's brief for a space that would to encourage collaboration and innovation. "We used natural materials that gradually age and age gracefully," explained Jones. Many of the materials are self finished, such as the timber flooring requested by Bloomberg, where each board is attached to a raised metal floor with magnets to allow for easy access to the cables below. As part of Bloomberg's commitment to cultivating neighbourly relations 90 per cent of the project cost was spent on hiring British workers and using a variety of local materials. The worsted fabric used for wall panels in the auditorium is from reopened wool mills in Huddersfield, the aluminium for the petals was mined in Glamorgan in Wales, and the stone frame that makes up both the exterior and interior walls was from Derbyshire. "So much of the building is hand crafted," said Jones. "We had to breed a whole new generation of stonemasons to do the outside and inside. All of these trades engendered another generation of skills." Bloomberg even funded an apprenticeship scheme for young people to learn the language used on some of the artefacts displayed in the Roman Temple of Mithras that has been restored to it's original location and will be displayed in the basement levels of the headquarters. While the time and resources allocated to this level of development err on the extravagant, the innovations such as the lifts, the integrated ventilation system and the magnetic hardwood floor are being applied to other projects. This sharing of best practices contributed to the building's high BREEAM sustainability score. The concept of neighbourliness runs through the private and public parts of the headquarters. Although the site had planning permission to build up to 22 storeys, the headquarters is 10 storeys in total. The plan floods the site, with public spaces and a reinstated Roman road, now home to the Bloomberg Arcade, cut into it so as to fuse it with the fabric of the city. The ground floor of the arcade is filled with restaurants serving everything from pizza to poké. With kitchens included but no canteen, employees are encouraged to go out and eat in surrounding restaurants. If they're peckish they can always refuel on the free snacks in the "pantry", an expansive, column-free hall with iPad operated coffee machines and uninterrupted views of the dome of St Paul's Cathedral. Bloomberg commissioned six new pieces and acquired two more from eight artists, and installed them around the site. Christina Inglesias' Forgotten Streams is a three-piece sculpture spanning two of the public plazas. Water run over bronze casts of branches and leaves echoes the ancient Walbrook river that used to run through the site. Two huge sheets of rippling milled aluminium have been set into the top of the lobby and the base of central vortex. No future is possible without a past, by Olafur Eliasson, gives the impression of viewing two sides of a shimmering pool of water as visitors move through the building. There are also installations from Pae White, Michael Craig-Martin, Artuto Herrera, David Tremlett, and Ben Langlands and Nikki Bell. Recent projects from Foster + Partners include an Apple Store in Chicago with a silvery roof shaped like a giant laptop computer and Canada's tallest skyscraper.